The Burrowing Owls (Athene cunicularia) are also known as Billy Owls, Ground Owls, Long-legged Owls, Prairie Owls and Prairie Dog Owls. These small - yet long-legged - owls are about the size of large robins. They occur naturally throughout open landscapes of North and South America. Numerous subspecies have evolved - including one in Florida and several found on the Caribbean Islands. During the daytime, they are often seen perching on low posts or sitting on the ground; or they are found roosting at or near the entrance of their burrows. When hunting, they fly low catching insects and very small rodents. Their long legs enable them to chase their prey on the ground. What distinguishes them from other owls is the fact that they nest in in burrows in the ground (hence their common name), frequently taking over prairie dog or ground squirrel holes. In North and Central America, this is the only owl that roost and nest in holes in the ground. Most other owl species nest in tree cavities. Additionally, the Burrowing Owls are mainly diurnal (active during the day); however, they may feed at all times of the day or night. Their expected lifespan in the wild is least 9 years or 10 years in captivity. They often get killed by cars as they cross roads; and are preyed upon by badgers, coyotes, snakes, as well as cats and dogs. 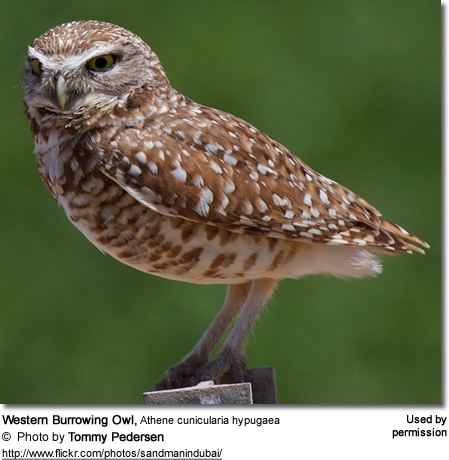 The Burrowing Owls are widespread throughout grassland habitats, from North America where their range stretches from southern portions of western and central Canada (British Columbia, Alberta, Saskatchewan and Manitoba) south through western and central United States. Populations also exist in Louisiana and Florida, and the Caribbean islands. Their range extends south through the western parts of Central America reaching as far south as southern Argentina. Their distribution in South America is patchy in the northwest through the Andes; but they are widely distributed from southern Brazil to Patagonia and Tierra del Fuego in Argentina. In the southern areas of their range, they are year-round residents. In September and October, those breeding in Canada and northern USA typically migrate south to Mexico and southern USA for the winter. In March and April, they usually travel back to their breeding territories. Canadian owls generally migrate further south than those occurring in the United States (as established by Banding studies). The most important wintering area is California, followed by New Mexico, Florida, Arizona and Texas. They are typically associated with open, dry habitats with sparse, low vegetation, such as grasslands, rangelands, agricultural areas or deserts. Many have adapted to human-modified habitats, such as airports, golf courses and agricultural fields. 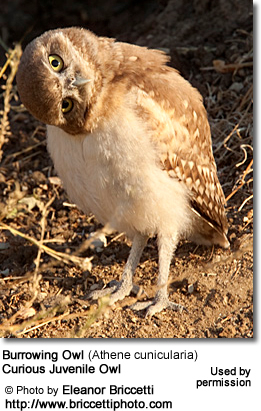 Burrowing Owls are endangered in Canada and threatened of extinction in Mexico. Those occurring in South America are expanding their range as deforestation creates the open habitats they favor. Populations occurring in western USA have seen significant declines in recent history, which are attributed to prairie dog control programs and loss of suitable habitat. 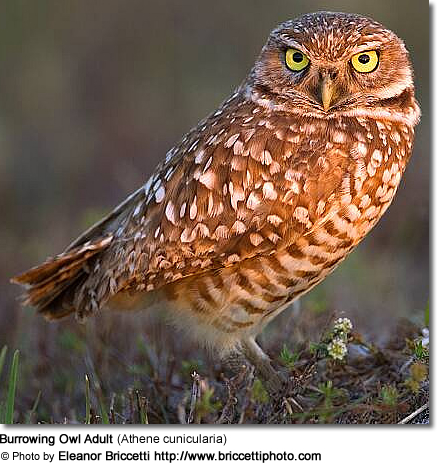 The average Burrowing Owl is slightly larger than an American Robin or about the size of a Meadowlark. They generally measure between 8.5 - 11 inches (21.6 - 28 cm); have a wingspan of 20 - 24 inches (50.8 - 61 cm); and weigh 6 - 7.5 oz (170.1 - 214 g). Depending on the subspecies, the color of the bill ranges from dark yellow, yellowish to light greyish; and the markings on the chest and abdomen are white with variable brown spotting or barring. The brown-colored head is round, with a flattened facial disc. They have prominent white eyebrows and a prominent white "chin" stripe that they expand and display during certain behaviors, such as a head bobbing when agitated. 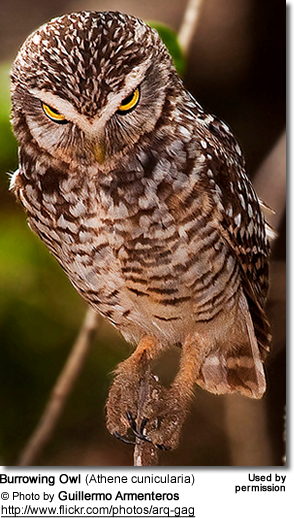 The most unique physical feature is the length of their yellow legs, which separates them from other small owls. They also lack the ear tufts of most other owls. The wings are brown with white spotting. 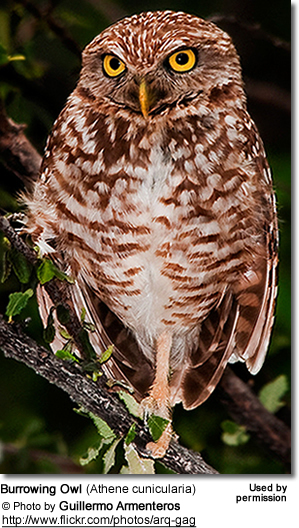 The upper plumage is barred; while other small owl species have a streaked upper plumage. Their eyes (irises) are bright yellow. Males and females generally look alike; except females tend to be heavier; however, males tend to have longer wings and tails. Adult males often have a lighter plumage as well, due to the fact that they spend less time in burrows than females and their plumage is then naturally "sun-bleached". For the same reason, their plumage may also be less soiled. Females tend to have a more greyish brown plumage and are generally not as heavily barred below as males are. 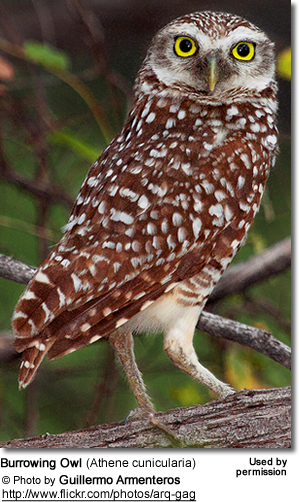 Immature owls resemble the adults; but the head, back and wings are mostly brown; and the chest and abdomen are whitish. They lack most of the white spotting on the upper plumage and brown barring below. They molt into an adult-like plumage during their first summer. Their legs are greyish and longer than those of other owls. In North America, most nesting occurs from late March to May. Breeding usually occurs in open grassland or prairie. They may nest near roads, homes and farms. 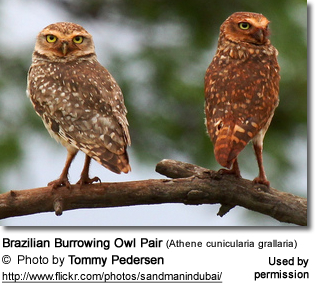 Burrowing owls are usually monogamous, but occasionally a male will have two mates. Polygamy (mating with several females) and potentially intraspecific brood parasitism (laying eggs into the nest of other owls) may explain the results of a DNA fingerprinting study that showed that 37% of burrowing owls were raising owlets other than their own biological offspring. The males perform courtship displays to attract females, which can involve flashing their white markings, cooing, bowing, scratching and nipping; as well as circling display flights or rising quickly up to 100 feet (30 meters), hovering for several seconds, then dropping about 50 feet (15 meters). This sequence typically is repeated numerous times. Pairs of owls will sometimes nest in loose colonies. This may be in response to readily available nesting sites in close proximity or an abundance of food sources in one particular area. It may also serve as a mutual defense system, as colony members can alert each other to approaching dangers and join in driving intruders off. 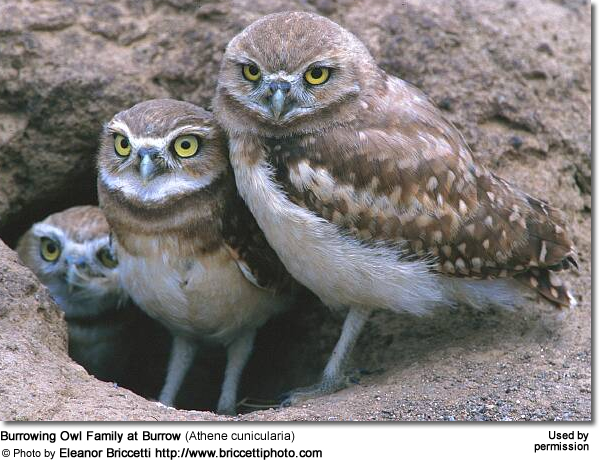 Pairs will aggressively defend small areas around their nest sites against other burrowing owls or predators. A unique feature amongst owls is that Burrowing Owls nest underground. If available, they will take advantage of abandoned burrows dug by ground squirrels, badgers, prairie dogs or other mammals. They have also been known to evict other animals from desirable burrows. In areas where no existing ground nests are available and soil conditions allow them to do so, they often dig their own burrows. They may also accept man made nest boxes placed underground, or nest in other shallow, underground, man-made structures that have easy access to the surface. 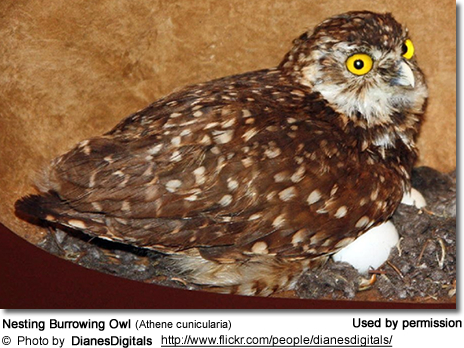 While resident owls often reuse nesting burrows over several years, migratory populations are less likely to do so. Male owls were more likely to reuse nesting sites than females. The female lays 4 up to 12 white eggs (average 6.5 eggs) over a two-week period. The eggs are being laid at intervals of 24 - 72 hours, until the clutch is complete. The female alone incubates the eggs for 28 - 30 days, while the male brings her food and stands guard near the burrow. The incubation typically starts after the first eggs has been laid, resulting in multi-aged chicks, and the competitive advantage for food by the older chicks may be the reason why generally only 4 - 5 chicks survive to leave the nest. The owlets hatch blind and partially covered with down. Their eyes open when they are about 5 days old. They are fed and protected by both parents. When they are about 14 days old, they can be seen rooting at the entrance to the burrow waiting for their parents to return with food. They leave the nest when they are about 44 days old and start hunting insects when they are about 49 - 56 days old. They have usually mastered the art of flying by the time they are about 6 weeks old. Burrowing Owls feed on large insects (termites, grasshoppers, crickets, beetles, spiders), small mammals (rodents, such as mice, rats, gophers, cottontail rabbits, and occasionally ground squirrels; and cottontail rabbits), bats, small birds (sparrows, wrens, larks, and other birds up to the size of mourning doves - which are generally larger than they themselves), snakes, lizards, frogs and scorpions. When food isn't readily available, or when being faced with hungry chicks, they may prey on owlets from nearby nests to cannibalize or feed to their own young. Unlike other owls, they will also eat fruits and seeds; for example those occurring in the Southwestern United States and Northern Mexico particularly like the fruit of Tasajillo and prickly pear cacti. They usually forage for insects in the day and small mammals in the evening. When hunting they wait on a perch until they spot prey. Then they swoop down on prey or fly up to catch insects in flight. Sometimes they chase prey on foot across the ground. These very vocal owls emit a variety of calls, including two-syllable "who who" given by adult males seeking to attract females or defend their territories; as well as various chucks, chatters and screams, which may be accompanied by head bobbing. Alarmed juveniles give hissing calls that sound like those made by rattlesnakes. Adults will give a short, low-level "chuck" calls to warn of approaching predators.